Often described as the "Capital of Scandinavia," Stockholm traces its origins back seven centuries, when it was founded on the island of Gamla Stan and became the capital of Sweden. Today, the city covers 14 separate islands connected by bays, channels and inlets. 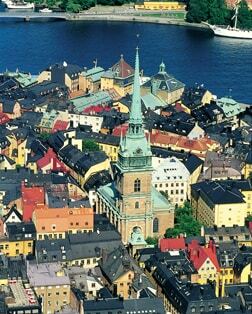 The skyline is a sea of copper roofs grown green with patina, towers, spires and graceful cupolas stand sentinel over the historic Old Town (Gamla Stan). With its population of nearly a million people, Stockholm is one of the world's most beautiful, clean and orderly cities. With a history stretching over seven centuries, Stockholm is not just a beautiful city but also Sweden's center of art and culture. Gamla Stan is one of the largest and best-preserved medieval city centers in Europe, boasting a wealth of pedestrian-friendly sites, such as Storkyrkan, the Cathedral of Stockholm. The Vasa Museum was built to house the Vasa, a 226-foot-long warship that sank on its maiden voyage in the middle of Stockholm in 1628. Today, it's the most visited museum in Scandinavia. Once home to the King of Sweden, the Royal Palace is one of the largest palaces in Europe with over 600 rooms and several museums. The Royal Armoury houses a collection of different items including clothes, horse carriages and more which has belonged to different royalties over the centuries. Stockholm City Hall, with its spire featuring the golden Three Crowns, unique art treasures and magnificent banquettes, is one of the most famous silhouettes in the city and a popular tourist attraction. The world's first permanent ice bar is kept at a crisp 23°F all year round. The interior, including the spectacular glasses, is made of pure, clear ice from the Torne River in northern Sweden. Less than an hour outside of Stockholm is Sigtuna, Sweden's first capital. Founded in the 10th century, Sigtuna is home to Skokloster Castle and charming wooden buildings by Lake Mälaren. Stockholm's 14 islands are separated by sparkling waterways. A cruise along the waterways and canals takes in virtually every major venue, including City Hall, Stockholm's National Museum, and the Royal Palace.